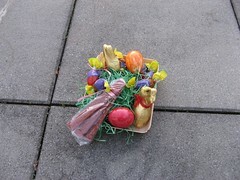 Ever wonder just what fluffy bunnies, candy peeps or pastel colored eggs have to do with Jesus? The answer just might surprise you. Please read this article: The Connection Between Easter and the Ancient Assyrians. Since most of the customs used in connection with Easter have pagan origins, I prefer to celebrate the death of Jesus Christ rather than his resurrection. The Bible says that Jesus himself commanded his followers to commemorate his death, not his resurrection. This commemoration takes place annually on Nisan 14 of the ancient Hebrew calendar. What do you think? Does it really matter what the Bible says? Typically writer’s spend the majority of their day quietly by themselves in front of a computer screen, quite often still wearing their p.j.’s or sweatpants.Perhaps they didn’t even brush their teeth before they started their word count for the day. All the excitement in their lives is taking place only in their minds. From outward appearances, writer’s don’t seem intriguing at all. On top of it all, a writer’s life is sedentary. But there are some writers who do manage the level of fame of, say a movie star or a wild, free-living musician. These writers live life in a very big, and exciting way. Their fans can’t get enough of them, they write letters of adoration, and maybe even pattern their lives or writing style after them. F. Scott Fitzgerald, author of The Great Gatsby, lived large. He wasn’t the model of healthy lifestyle or modesty. Tragically he died of a heart attack brought on from years of alcoholism and exhilarating roaring 20s partying. Grace Metalious, the author of Peyton Place, died from organ failure brought on by years of drinking. She skyrocketed to fame after her fictionalized tell-all novel of the soap opera life of a quiet small town hit the book shelves. Fame may have gotten to this young mother’s head, she spent most of her money on extravagances and partied hard. As for her housekeeping skills, she says she spent “too much time in front of a typewriter instead of a sink.” Her life spun rapidly out of control, and in the end a ghostwriter had to be brought in to finish the sequel Return to Peyton Place. Steig Larsson ate junk food,smoked, and lived a stressful life before hitting it big with his Dragon Tattoo series. Some say he was the male counter-part to his famous heroine Salander who also loved junk food. He ended his all-too-short career when tragically he collapsed from a heart attack after climbing a flight of stairs. What does all this tell you? Write like a legend, but live a healthy lifestyle. Keep on writing and keep on living. The advice I give to writers everywhere: eat plenty of dark green leafy vegetables, take fiber, drink green-tea for a healthy dose of antioxidants, and exercise. The National Holocaust Day of Remembrance will be on April 8, 2013. In commemoration a special presentation will be given at the University of Nevada, Reno on Sunday, April 7 from 3 p.m. to 4:30 p.m. in the Joe Crowley Student Union, Ballrooms B and C.
This year Joseph Kempler, eighty-four-year-old Holocaust survivor, and I will be attending. We will be listening to Professor Emeritus Robert Krell discuss his personal and professional experiences on the subject of the Holocaust. Dr. Krell and his family were hidden by a Dutch family who sympathized with the Jews plight. A Reno resident, Julia Berg, is the daughter of that family. She compiled masses of research on the Holocaust and her own family and self-published her family story in two volumes. Ms. Berg also conducted a short interview with Joseph Kempler and has added his brief account to her Holocaust display. The theme for the 2013 Day of Remembrance is Never Again: Heeding the Warning Signs. Decisions made today on issues of hatred really do impact the future. We can sincerely mean the phrase “Never Again” by standing up for what is right no matter how hard the choice may be or its consequences. Join me and Joseph Kempler in this special day of remembrance for all those lost to the Holocaust.